I’ve just spent the last hour crying. There is a good reason we carers are referred to as #carersincrisis, you know. Because we are in crisis, have no doubt. What sent me into a stream of tears? Well, upon doing my son Brendan’s cares this morning, I found that he has yet another skin breakdown. Please, keep reading so I can explain why I’m crying; why I’m so angry. Today is 3 weeks until his tentatively scheduled spinal fusion…after waiting on the urgent list now for over 16 months. The skin must be healed by then or they won’t be able to do the operation due to infection risk having an open wound. Simon, do you understand the implications of this new development? Do you understand that if he had received the spinal fusion within the 4 month time frame, these skin breakdowns would not even be occuring because his body wouldn’t be continually crushing in upon itself from the ever-worsening scoliosis? And do you understand that if he declines to the point of being unfit for a spinal fusion, he will die a slow death betrayed by his own body? Do you understand that it feels like my heart is being torn out of my own body as I look at my precious first born child laying on his medical bed suffering? Do you? Simon, my son turns 14 years old 2 weeks from today, on October 1st. 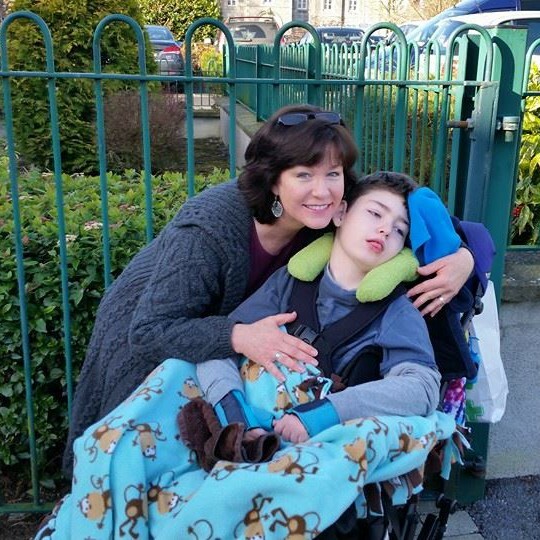 I have given everything I have, and then some, to assure Brendan receives all the proper care, attention, love and everything else required for his complex medical care. So please hear me when I say this: His current skin breakdown, his current medical complications from the scoliosis, and his current suffering, are 100% not my fault. They are the fault of a broken system that is leaving children like my son to decline until they are not even fit for the surgery they need. And that is nothing short of barbaric and inhumane. In the next 3 weeks, I will use all of my skills and experience to see this latest skin breakdown healed in time. It isn’t in an easy spot to heal, especially considering there is also an area of vulnerable skin on the verge of again breaking down going from his right side all the way around to mid-back at his waist. This latest skin breakdown is on his left groin area where his leg meets his torso. You see, Simon, because of the worsening scoliosis, his left leg is even more out of socket than it was on June 1, 2017 when he was first placed on the urgent waitlist for a spinal fusion. And, his lower ribs are pushing down on his pelvic bone. All of this causes an exaggerated deepening of creases. Had Brendan’s spinal fusion happened last year as it should have, NONE of this would be happening now. I’ll end this blog piece asking you to truly empathise…put yourself in my shoes. Maybe even go home to your wife and read this blog piece to her. What if this was your precious first born child? What would you do? You’d never have let this happen. That’s what you’d do, I have no doubt. So please, fix this, not just for my son, but for all of the children in Ireland who are suffering inhumanely. Now. If i were a rich man iwould pay for your son to have this fixed.all my prayers are with you both.I am a father to. There are no availability of private treatment for any of our children in Ireland. I don’t want to insult parents with no private ins, whose children require operations, but private insurance doesn’t help. I can’t understand why the HSE can’t buy treatment for these poor children. My heart goes out to Brendan and his mother. It makes me so angry that ireland is failing to care for the most vulnerable citizens. Sending my best wishes.